Show of hands, who feels like they have too much to do and not enough time to get it all done? Yeah, me too! When it comes to making sure everything gets done, it can be a tough balancing act. That’s one of the reasons setting priorities is so important, so we can focus on the areas that matter most to us. But that’s only half the problem. The other side of that is that there is still all these things that we need or want to do, and they’re floating around in our heads. All that mental clutter tries to draw our attention to it and soon we find ourselves feeling very scattered. That’s where having a master to do list can come in really handy. There are a number of tips and tools that we can turn to when we’re feeling scattered. Earlier in this challenge I talked about one of my favourite ways to tame a scattered brain by using a brain dump. A brain dump is great way to clear away internal clutter. 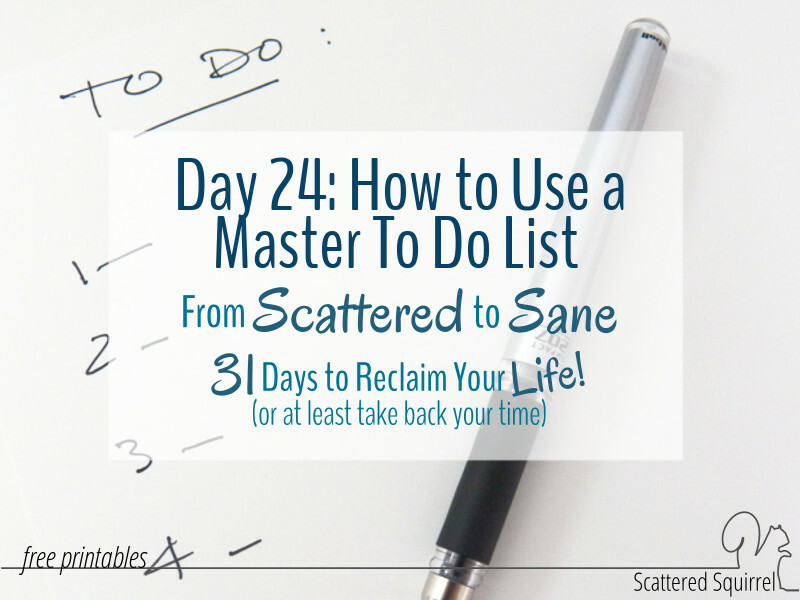 Today I’m going to share how to take that step to a whole new level by creating a master to do list to help get those pesky to do’s out of your head so they stop trying to via for your attention. A master to do list is simply a list where you keep track of everything you need to do. You can make this as simple or as complex as you like and as your needs require. I prefer to keep a few different master lists for the different areas of my life, but I know many people who use a single notebook and just add to the list as things pop in their head. There are two ways that I use a master to do list. Use it as a structured brain dump. Sometimes a regular brain dump just isn’t enough to clear my head. For me, this usually signifies that I am in need of a little more structure. So I’ll add things to my master to do list, or even create an entirely new one. I take the time to think about what I’m writing on the list, sometimes I add in a time frame for how long I think a task will take, other times I take a few minutes to colour code them or highlight groups of tasks that seem to go together. This kind of master list, for me, stays on my desk or in my planner for a week or two and then gets tossed into the recycle bin. Before I toss it, I go through it and jot down any remaining items that I feel are important onto my other master to do lists. 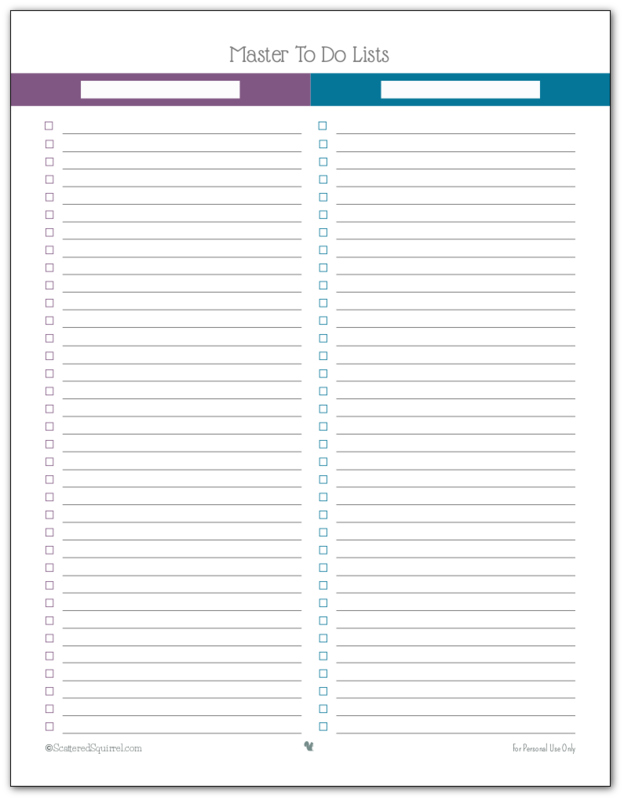 To keep a running list of tasks or jobs that need to completed. This master list is one that I will keep in my planner and pull out when I have some free time or when I’m sitting down to plan out my month. When something comes up that needs my attention or if I notice something that needs to be done around the house, I write it down on these lists. I keep different lists for different areas of my life so that I can prioritize and spread out the tasks. These lists won’t find their way into my recycle bin until everything is crossed off them or I’ve transferred all the undone items to a new list. The biggest difference between a master to do list and a brain dump is intention. By creating a master to do list, you’re saying to yourself that these things are important and need your attention. You are creating a plan to deal with them, even if all you’ve done right now is make a list. On the other hand a brain dump is just designed to get things out of your head so you can stop worrying about them. For me, a brain dump usually comes before I create or add to my master lists. I usually wait a day or two and then go through what I wrote and add items onto my master to do list where they fit. I try to make sure that I’m not overloading my lists with a bunch of things to do, rather I try to choose what is important or urgent and forget about the rest. At the beginning of each month I sit down with my lists and see if there any season tasks that need attention that month. Then I pick at least one item from each life area and schedule a day to get it done. Through out the month when I have some free time or I’m in the mood to tackle something in a certain area, I pull out my list and see what I can do. Because I use my master to do list in part of my planning process and refer to it throughout the month it has help create this internal understanding that if I put something on that list I’m not going to just forget about it, unlike with a brain dump. This tool can really help to keep your thoughts less scattered and allow you to focus more on the things that need your attention. I keep a running master to do list in two different places – at the front of my planner where I jot things down as I think of them and in my planning section of my planner where I organize all those items into categories or life areas. The one at the front is just a piece of lined paper that I replace as it gets full. 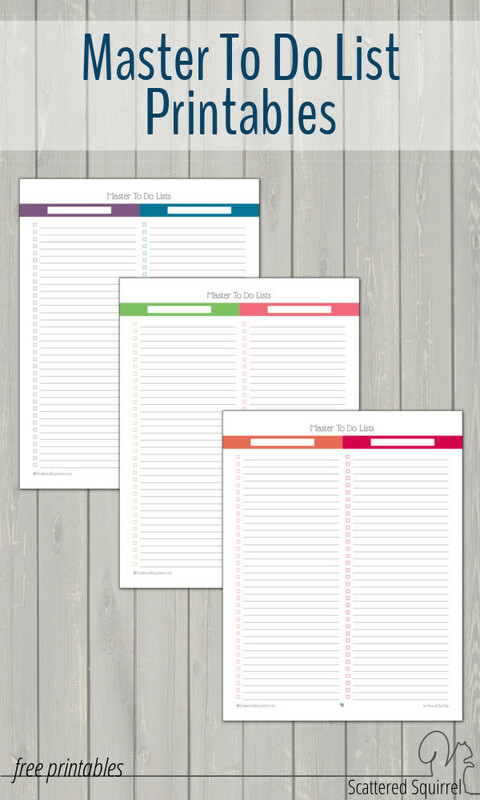 In my planning section though I use my to do list printables to help keep my lists organized. I decide it was time to update that section a little and whipped some new Master To Do List printables to match the 2016 calendars. Fill in the top section with whatever category you want. Or use one for each month. You could cut them in half and hang them on your fridge or message board. Or do like I do and keep them in your planner. I’m sure there a are hundred different ways these could be used. As always to snag a copy for yourself simply click the pic! For those that want all of them I have them all bundled together in one document for you, just click the pic below. 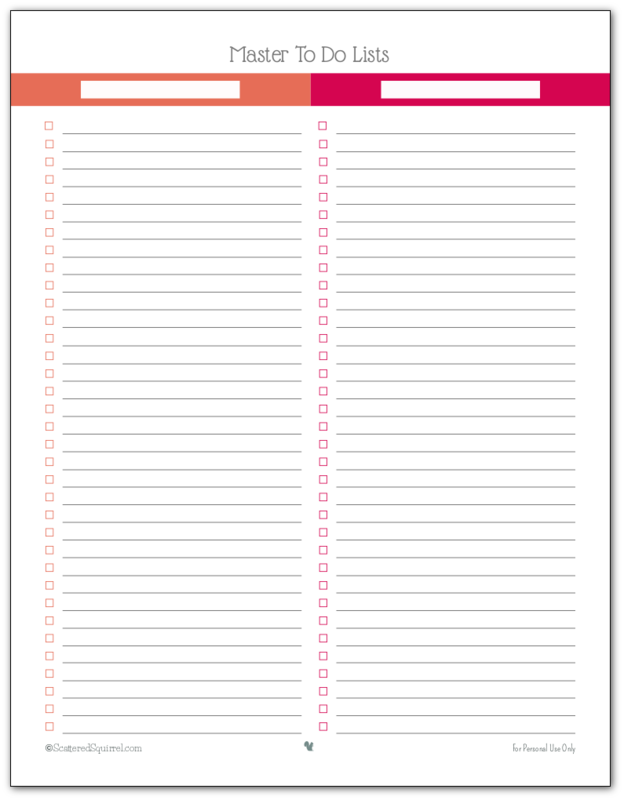 Whether you choose to use these printables as a master to do list or something else, I do hope you’ll at least give creating a master to do list a try to see if it works for you. I know for me that it is one the quickest ways tame my scattered brain when I feel like I have too much to do and not enough time to do it. Give it a try and see if it does the same for you. 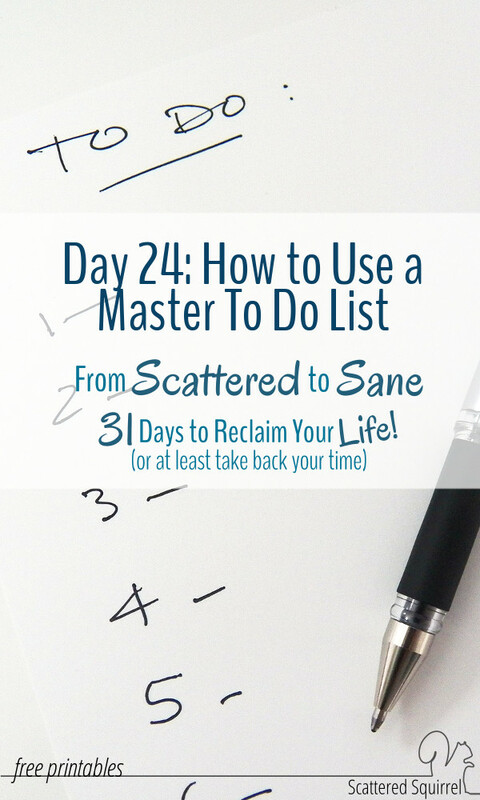 Do you use a master to do list? Do you find it helpful? A brain dump and a master to do list go hand-in-hand. But, one also needs to remember that there’s the daily lists and weekly and monthly lists, so far as the brain dump goes. Getting everything you want to do out of your head is an amazing thing. Sometimes it will take more than one “session” to get through everything – as well as doing it often, so things don’t just languish because you already did one dump, you shouldn’t need to do another, right? Love your points Jessica, they are so true. A brain dump is definitely one of those things that should be done often, especially if one is feeling overwhelmed or scattered. I love the idea of leaving the brain dump as a master list. Mine are usually too hard to read, so I tend to transfer everything over to a new one. Maybe I missed it, however, I love keeping these in my planner. Do you have them in half page format for 2016? I love the 2016 color scheme, BTW. 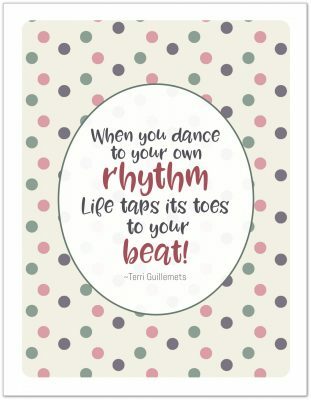 Thank you so much for the free printables. I would like to sin scribe to your blog. I cannot find a place to subscribe. Hi Connie, Thank you so much. I’m working on getting the news letter sign up done right now. 🙂 Sorry about the confusion. We were having some major technical difficulties with my site, so we had to bump up the launch of the new redesign before I was ready for it. It should be ready later on today. Are you planning on making these for the Half size as well? I absolutely LOVE the full size, and would like to be able to put these in my planner as well! By the way, your site is amazing, and anytime someone asks where they can get printables, I send them here. Thanks for taking the effort to design the template. It’s always amazing to see people’s generosity. I’ve downloaded and will be using it in my planner. I’m happy to hear that Rena. I hope you enjoy using them.